Welcome to 20 new Providence Associate candidates who began their year of sharing, growing and discerning with a Providence Associate or Sister of Providence companion on Oct. 20 at Saint Mary-of-the-Woods. Enjoy photos from the day. Learn more about Providence Associates here! Providence Associate candidates gather with sisters and other Providence Associates for a blessing ceremony during the orientation. Providence Associate Candidate Mary Catherine Chlipala and her Providence Associate companion for the coming year Sheila Galvin get to know each other during the orientation. Providence Associate Candidate Kay Hassan during a reflective moment at the orientation. Providence Associate candidate Jessica Claybomb and her companion Sister Rosemary Borntrager. Providence Associate Candidate Kathy Shickles visits with Sister Mary Montgomery before the blessing. Sisters Mary Jo Stewart and Shawn Marie McDermott with candidate Josephine Carbonaro after the blessing ceremony. Candidate Michelle Barrentine and her companion Sister Carolyn Kessler. Sister Rosemary Nudd visits with Providence Associate Beverly Okey and her husband William, a Providence Associate candidate. Co-Director of Providence Associates Sister Sue Paweski speaks to all those gathered for the Providence Associate orientation. The Providence community blesses Providence Associate candidates and their companions in a special blessing ceremony. Candidates and their sister companions sing during the blessing ceremony. Enjoying a walk in the Woods during a break. Sister Marilyn Herber and her candidate companion Karen Maynard enjoy their time together before the blessing ceremony. Providence Associate Joan Richards prays in the Shrine of Saint Mother Theodore Guerin. A statue of Saint Mother Theodore Guerin helps set the scene for the orientation. Candidate Stephen Modde and his companion Sister Carol Meyers. Providence Associate co-director Sister Sue Paweski, center, laughs with Candidate Debbie Fornefeld and her companion Providence Associate Joan Richards. Life-long friends and Providence Associate companions Sister Theresa Clare Carr and Gloria Morgan. Sister Teresa Costello with Sister Shawn Marie McDermott and her Providence Associate Companion Josephine Carbonaro walk down the hall at the Providence Associate orientation as they move into their spiritual journey of the coming year. Candidate and companion get to know each other better during a stroll through the Woods. 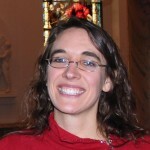 Amy Miranda is a Providence Associate of the Sisters of Providence and a staff member in their Mission Advancement office. Amy is a 1998 graduate of Saint Mary-of-the-Woods College. She currently manages the SP publication HOPE and works on marketing support for Providence Associates, new membership and Saint Mother Theodore Guerin.